Let's take a closer look at the keys to the 3D printing leader's third quarter. Stratasys (NASDAQ:SSYS) will report its third-quarter financial results before the opening bell on Wednesday, Nov. 5. The company has not provided guidance for the quarter (only for the full fiscal year), but Wall Street's analysts expect the 3-D printing leader to earn $0.57 per share on revenue of $195.5 million. These estimates would represent year-over-year growth of 55% on the top line and 27% on the bottom line, and investors seem to be expecting good news, since Stratasys' stock is up more than 25% since it reported second-quarter earnings with upgraded full-year guidance. As one of the two leading companies in the red-hot 3D printing space, Stratasys' earnings are always the source of much investor interest and speculation. But some elements of the company's upcoming report will be more closely watched than others. Let's dig into some of Stratasys' key data points to figure out what's most likely to move its stock on Wednesday and beyond. Will Stratasys boost its guidance again heading into the fourth quarter? Stratasys tends to boost its revenue guidance more frequently than it boosts EPS guidance -- since the end of 2012, it's only raised EPS guidance once, and that was when it raised full-year guidance from the $2.15 to $2.25 range to a new range of $2.25 to $2.35. The company's guidance boost in the second quarter was massive -- a $90 million upgrade works out to roughly 13% more revenue for the full year, and boosts year-over-year revenue growth expectations from 38% to 56% over 2013's $486.8 million top line. On the other hand, Stratasys' EPS guidance boost only increased year-over-year growth expectations from 20% to 26% from the $1.84 in adjusted earnings per share the company reported for its 2013 fiscal year. Stratasys bulls are willing to ride the company's revenue as it screams into the stratosphere, but bears continue to wait on the sidelines for net margins (particularly on the GAAP side) to return to pre-Objet-merger levels. Thus far, the bulls look to be right, but if Stratasys has to change course on its optimistic new projections -- or even boosts its top-line guidance while leaving its EPS estimates alone -- its fall surge could reverse as profit concerns resurface. How fast will MakerBot grow? *2013 and 1H 2013 data converted to quarterly on 1-4 and 1-2 ratio, respectively, when used to calculate sequential growth rates for quarterly periods that follow. **Q3 2013 data only available for Aug. 15 through Sept. 30. Figure here is doubled to represent a full quarter of revenue. As you can see, MakerBot produced more sales in the second quarter of 2014 than it did during the first half of 2013, but its limited financial data offers us little in the way of clear trends. Will we see a similar jump in third-quarter sales this year as occurred last year? This will be the first year that we'll actually be able to examine MakerBot's year-over-year quarterly growth rates, so seasonal differences or not, it will be very interesting to see how the segment's performing now that it's been fully integrated into Stratasys. 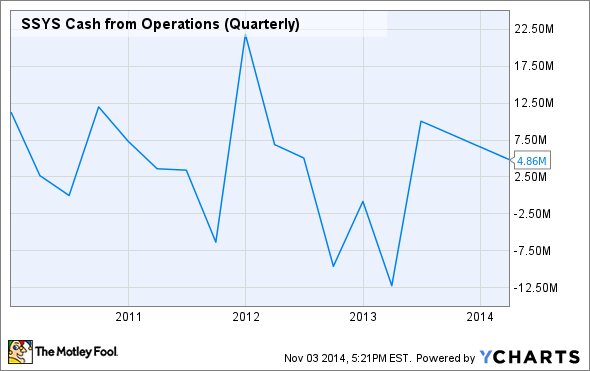 When will Stratasys' bottom line -- GAAP or adjusted -- become more relevant? *Q3 data based on current analyst consensus. Q4 data based on Stratasys full-year estimates, less Q1 + Q2 reported results and Q3 consensus. Stratasys' GAAP EPS tanked after its merger with Objet, and while this metric has improved somewhat in 2014, it has not been in positive territory on a trailing-12-month basis since the end of 2012. This can't be blamed on stock-based compensation, which can often produce huge swings in a high-tech company's earnings as it pays out millions to retain highly qualified employees and executives. For the first six months of 2014, Stratasys has adjusted away more than $38 million in the amortization of intangible assets (commonly used to write off goodwill from acquisitions) to reach its non-GAAP earnings figures, which is the equivalent of nearly 19% of its total sales for those two quarters. In contrast, famously acquisitive competitor 3D Systems (NYSE:DDD) amortized just $17.4 million in intangibles --roughly 6% of over $299 million in first-half sales -- over the same period. This is important to watch because it has occasionally been highlighted as a reason to be wary of 3D Systems, which has bought up so many companies that its intangible assets became the largest component of its balance sheet. Sources: 3D Systems and Stratasys earnings reports. SSYS Cash from Operations (Quarterly) data by YCharts. What will you be watching for when Stratasys reports on Wednesday? Editor's note: A previous version of this article treated MakerBot's revenue for the second half of Q3 2013, after Stratasys acquired it, as its revenue for a full quarter. The Fool regrets the error.